The bright light blinded Gao as he took his first unsteady steps out of the cave in days. The sun’s warm rays couldn’t touch the chill deep within him since the fear gripped him so tightly on that hunting trip. Sitting in the sun, Bo looked up as Gao stepped timidly into the light. She gave a slight smile as the young man shuffled slowly away from the darkness into the daylight. “Cold,” Gao complained as he sat down hard next to Bo. He rubbed his arms in a feeble attempt to drive the cold away. Bo simply nodded; she had felt it, too. “We chased when sleeping,” Bo said, looking over at Gao who was just looking at the ground. Gao nodded. His nights had been filled with visions of being chased by a predator, of running for his life. It was the same thing he had felt when that evil man took the skull out from under his cloak. “What happen?” Gao asked Bo directly. Bo furrowed her brow and shrugged, then gazed off into the distance. Gao just sat quietly and let the sun warm his skin and try to drive some of the darkness from his mind. He tried not to think of his recurring dream. After a bit, Bo patted Gao on the arm and stood up. She went to get a basket and went down the path away from the sea to do some chores. Gao sat for a while, listening to the sounds around him. The crashing of the waves seemed to sooth his troubles. He grew listless once he felt a little warmer. He got up, and walked down toward the sea. Down by the water’s edge, Han stood with a fishing spear, but having little success. From a distance, Gao watched him move slowly along the edge of the water, thrusting the spear into the water but come up empty each time. Han retreated from his task and took a seat on one of the large stones away from the water. Gao went down and joined him. Han didn’t acknowledge Gao’s arrival, he only stared out into the distance over the water. They sat in silence for a while as the sea breezes came in from the water, bringing the sharp, salty scent with it. Gao finally broke the silence. “The dreams…,” he started, his voice trailing off. Han only grunted in response. “What happen?” Gao asked, looking at Han. Han frowned deeply at the question. He kept staring at the sea. After a moment, he stood up. “Busy fishing, Gao. Go,” he said brusquely. Han picked up his spear and went back to the water’s edge. Gao stung with hurt and rejection. He watched Han walk away, not looking back. Gao jumped up and bolted up the path toward the cave, then controlled himself to walk and kept the tears at bay. Near the cave he took some of the cold remains of breakfast, his appetite returning after taking the first bite. “Gao!” the shout startled him as he was focusing on eating. Jor stood above him, looking down. “What?” Gao mumbled, quickly swallowing his food. “Come help,” Jor said as he walked off. Gao scrambled to his feet and took off after Jor. They walked down the path away from the cave. Gar decided to hold his tongue as the two walked together. “Large cat chase us,” Jor said, looking squarely at Gao. “Something chase us,” Gao agreed cautiously. Gao thought for a bit. How could someone hide a large cat calmly under his cloak? Something didn’t make sense. But, Gao just nodded. “Yeah,” he said without much conviction. Jor nodded and went back to work picking the berries. Gao sat and thought; the more he thought about it, the less Jor’s explanation made any sense. But, Jor seemed to want to believe it. He went back to work as the sun got lower in the sky. After a while, one of the girls walked down the path toward them. “Food soon,” Sen said as she approached the two young men working. “Thanks,” Jor said as he stood up. He picked up the basket and looked at Gao. “Go find Gar,” he commanded as he carried the basket back toward the cave. Gao looked around, not sure where to look. He saw Sen standing near, smiling. “I know where we find Gar,” Sen said with a sly smile. “Go and I follow,” Gao said. Sen set off walking and Gao followed. Sen started humming as they walked along. Gao smiled despite himself as he listened. Even with the sun starting to dip below the horizon, he felt warmth finally start to displace the chill he had felt for many days. “You have bad dreams?” Sen said suddenly, stopping her humming. Gao was confused for a moment, then understood her question. Her hand touched his shoulder and Gar looked at her. Sen was standing in front of him, humming once again. The sound calmed him, drove away the darkness. He reached out and placed his hand on her shoulder and steadied himself. “I don’t know,” Sen said, smiling, answering his unasked question. “Come, Gar is this way,” she said as she held out her hand. He took her hand and she tugged on it to lead him. They started running together, the exhilaration of the run and Sen’s touch helped drive most of the remaining dark chill from him. As they rounded a rock, they found Gar sitting and painting his body with dark pigment. Gar looked up as they came around the rock. He nodded and went back to his work. 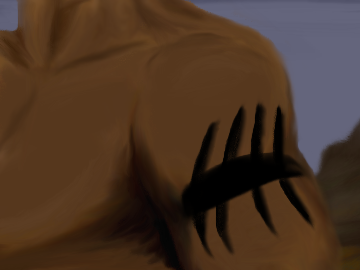 “Food,” Sen said as she watched Gar paint dark lines on his arm. Gar grunted a response without looking back up. Sen shrugged, waved at Gao, then ran back toward the cave. Gao watched Gar as he marked thick lines on his arm. He dipped his fingers into a small pool of black pigment near his feet. He had a sort of rhythm as he dipped his fingers in the pigment, painted a few lines, and then repeated the process again and again. “What that?” Gao asked when Gar took a break. “Strength. When young, I do often,” Gar said. He beckoned Gao over toward him with one hand as he dipped the other in the pigment. Gao stepped toward him hesitantly. Gao nodded but said nothing. Gar looked down at the black lines on his skin and felt an extra warmth from them. He felt good, better than he had in many days. The two hunters walked toward the glowing fire guiding their way back to the cave.